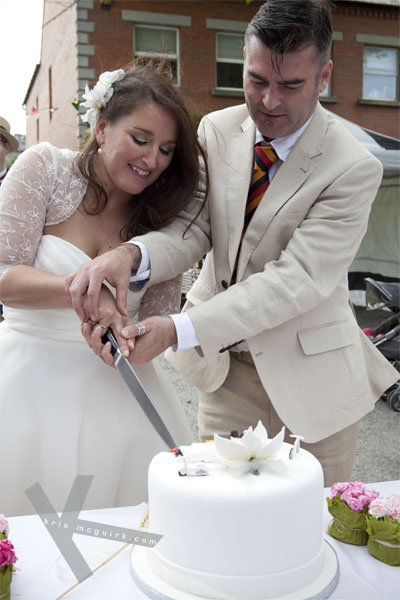 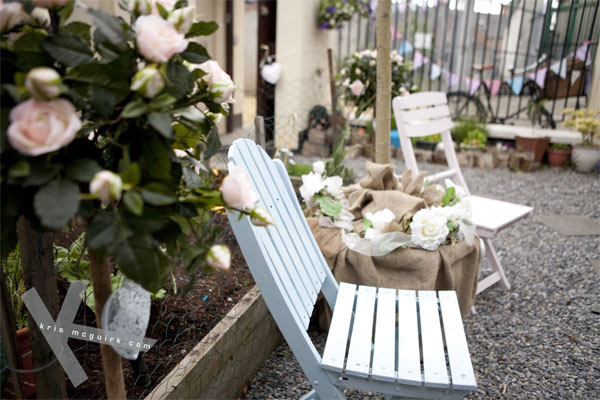 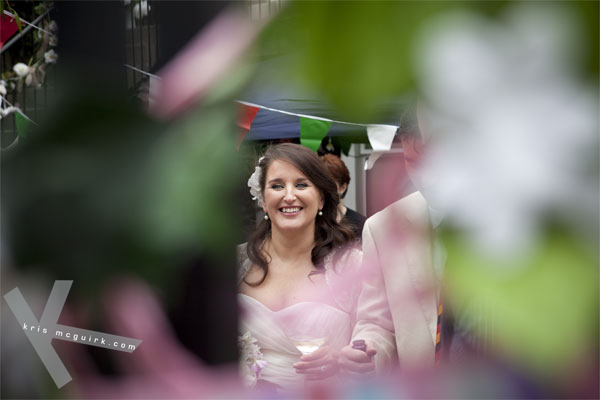 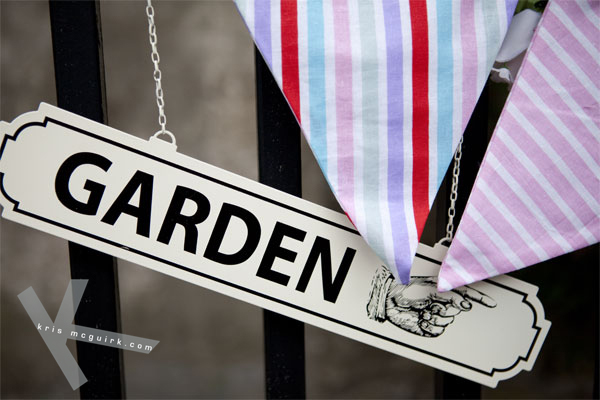 Freda and Ciaran’s Bloom’s Day and Garden Party wedding. 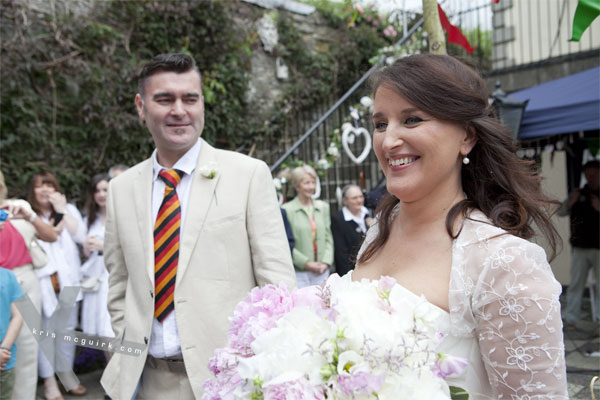 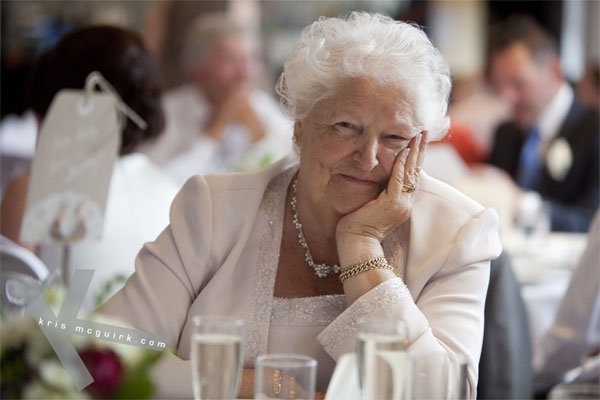 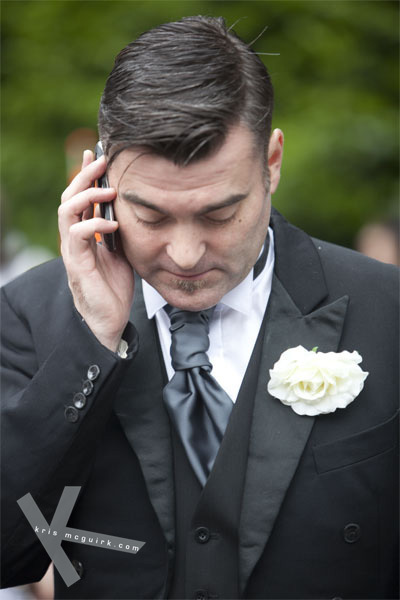 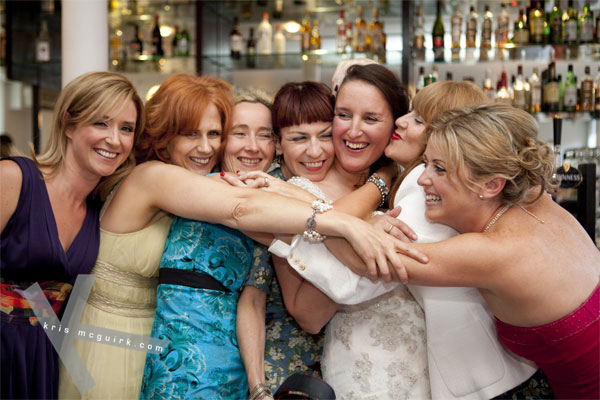 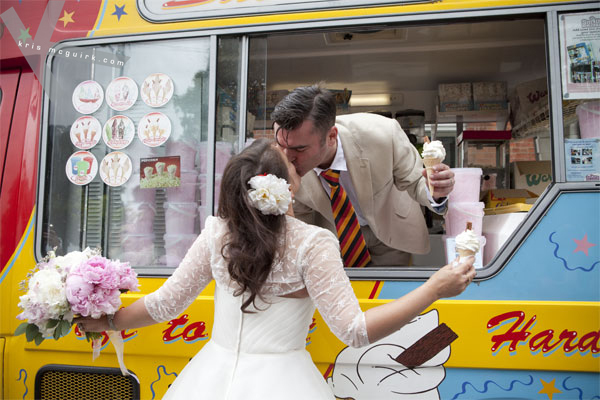 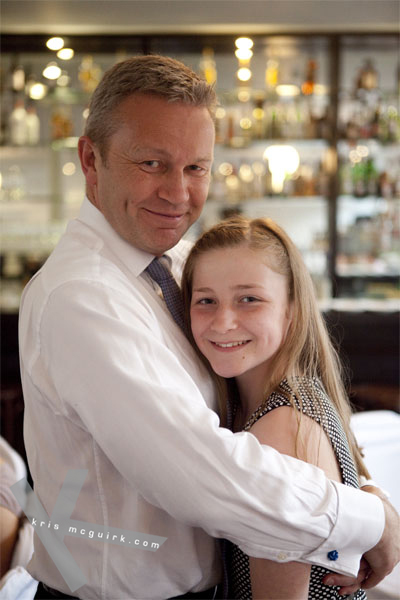 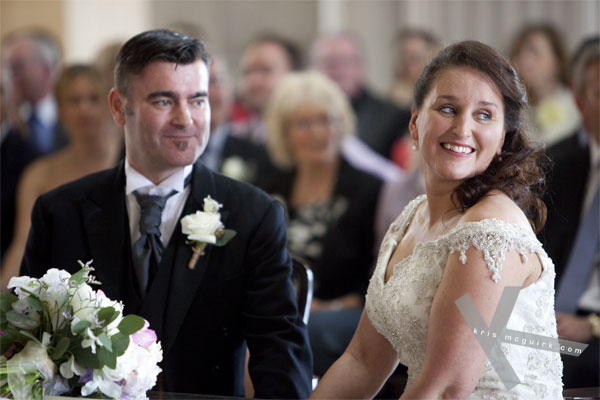 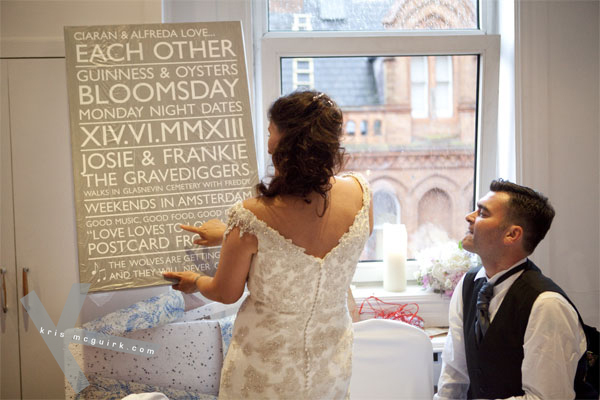 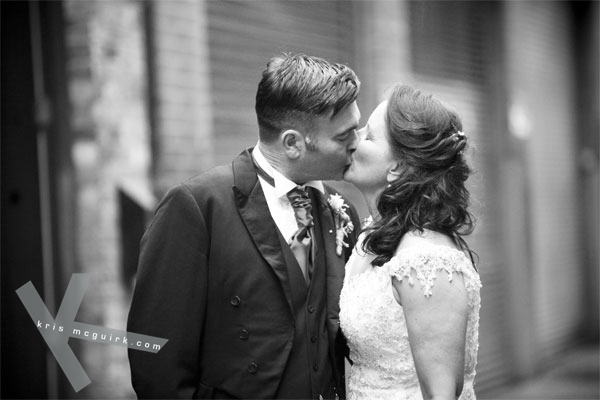 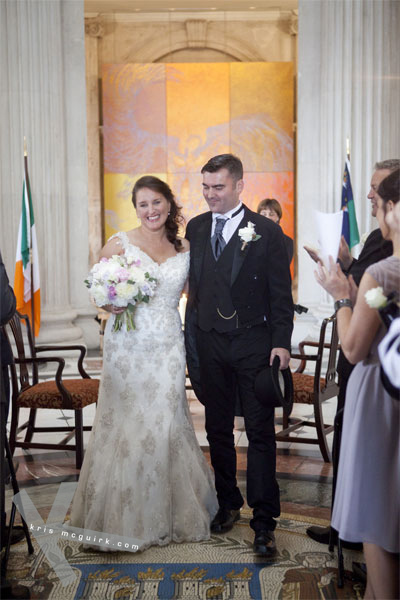 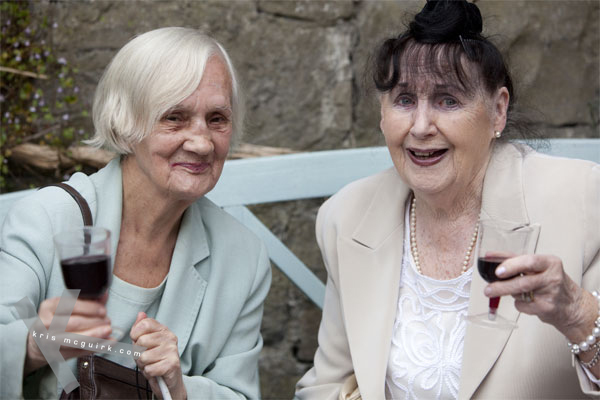 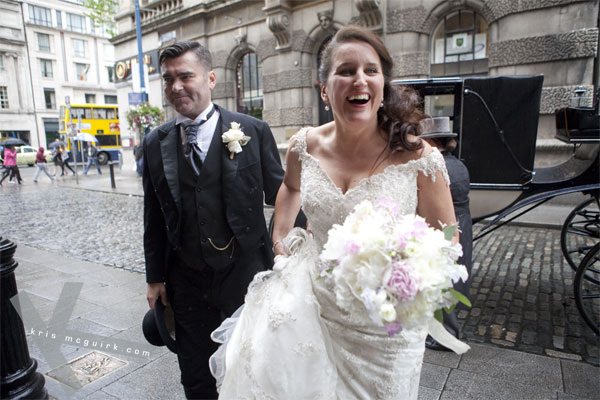 To say that Freda and Ciaran’s wedding was extraordinary is to say the very least. 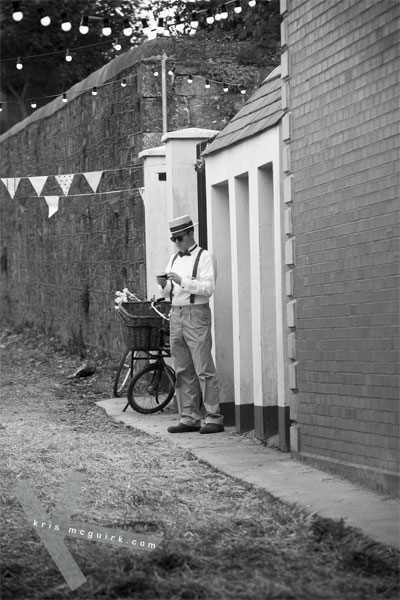 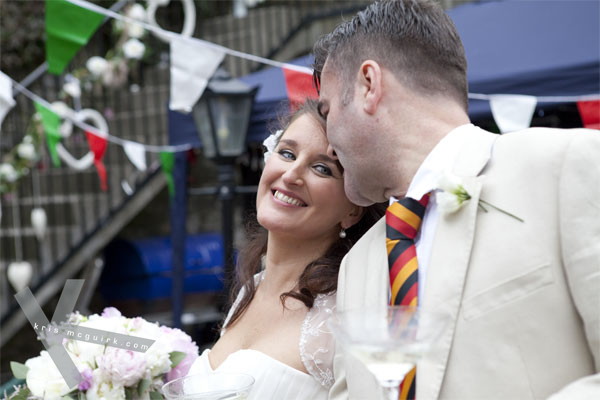 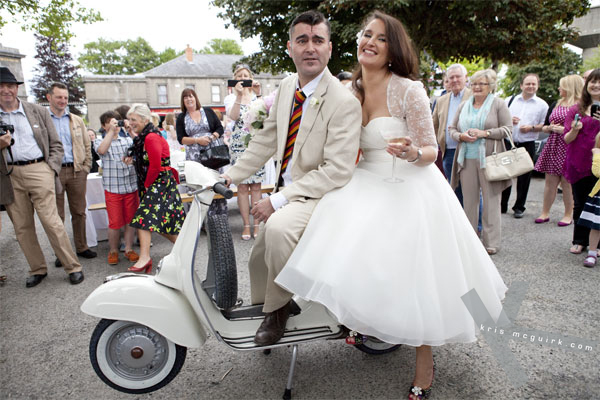 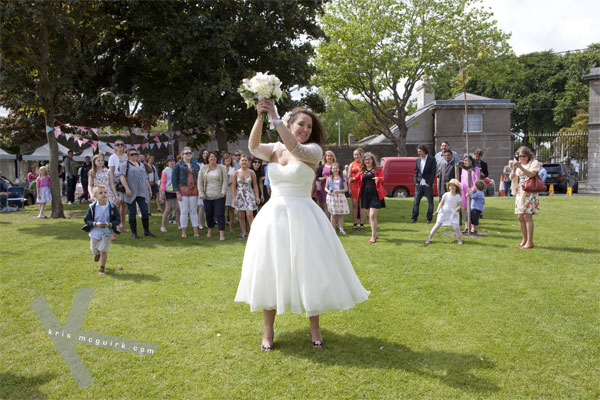 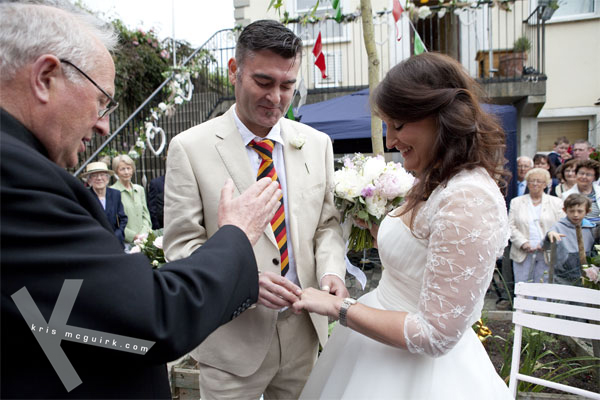 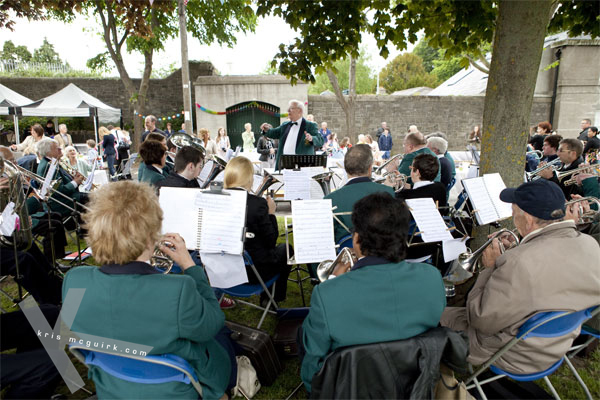 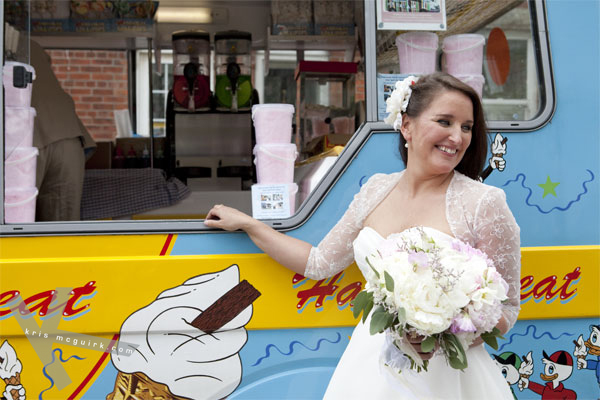 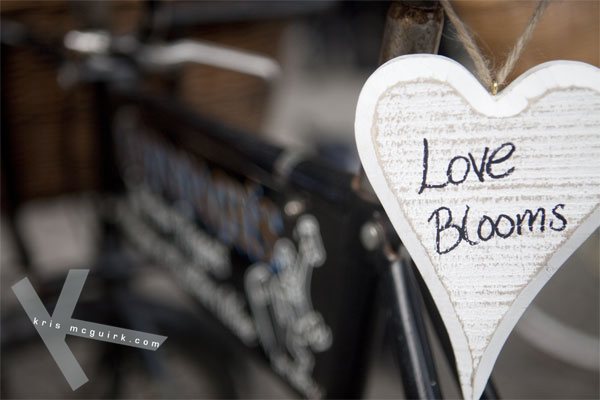 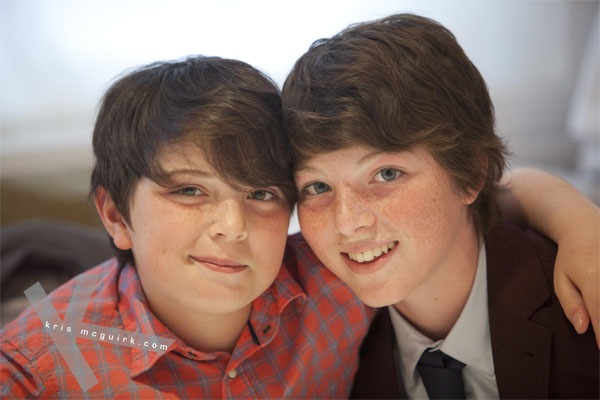 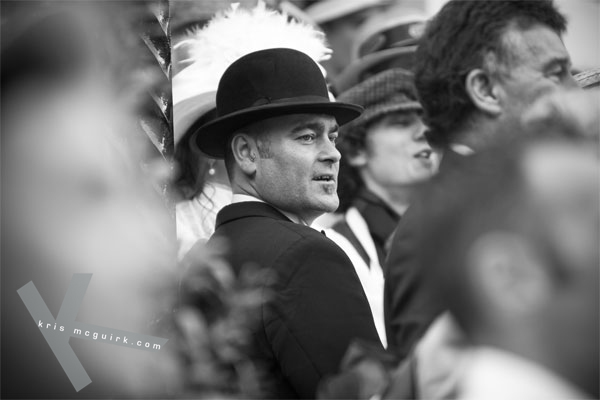 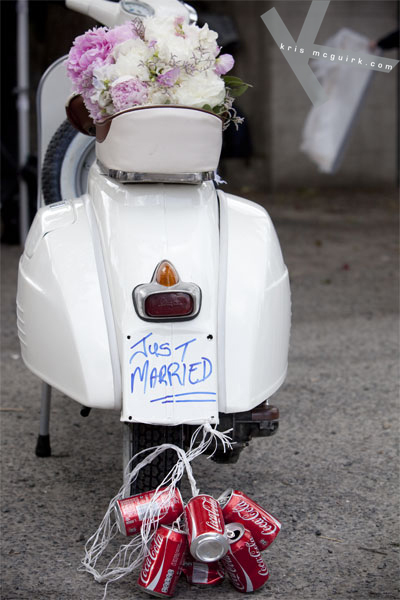 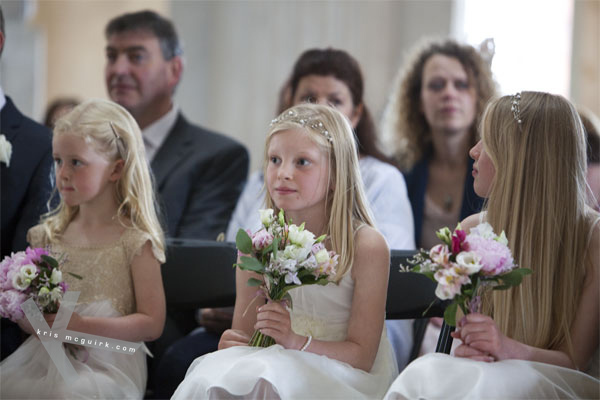 They chose to tie the knot on Bloom’s day so it was a wedding, a national day, a theatrical performance, a bicycle rally in aid of the Irish Youth Foundation (IYF) and a vintage fancy-dress party all rolled into one. 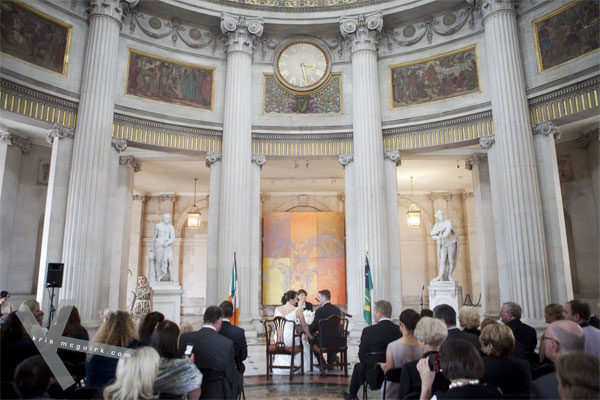 An amazing event that spanned over two days bringing the couple and their friends all over the heart of the Irish Capital and supporting a great cause. 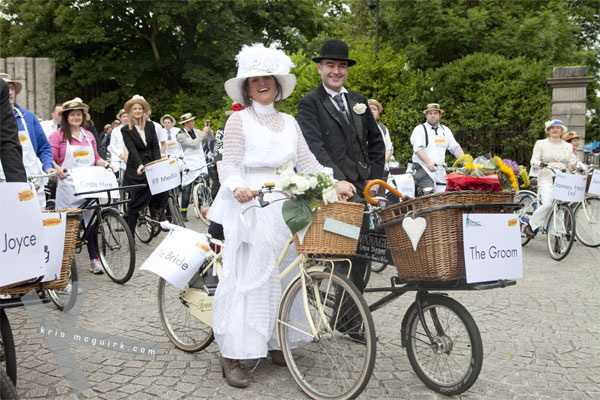 The day started early on a sunny corner of St Stephen’s Green with the annual charity IYF bicycle rally complete with Gardai motorbike outriders. 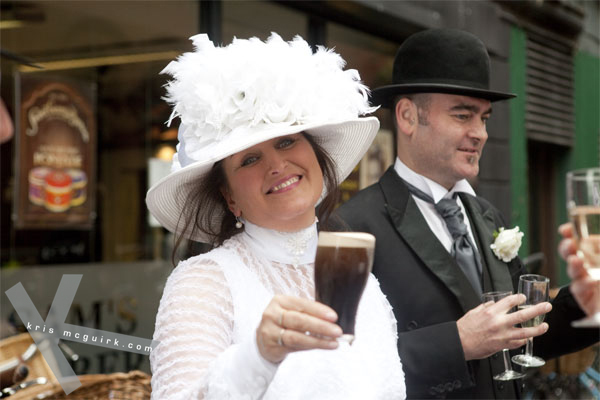 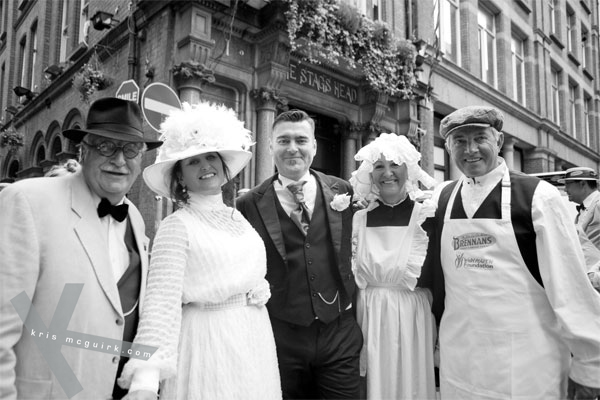 Freda and Ciaran have been avid supporters for many years so dressed in full Joycean costumes as characters from Ulysses, they navigated the historic streets in the city centre stopping to see the Lord Mayor at the Mansion House for a rousing rendition of Molly Malone and then on to a selection of fine, friendly public houses like the Stag’s Head, for Guinness and sandwiches. 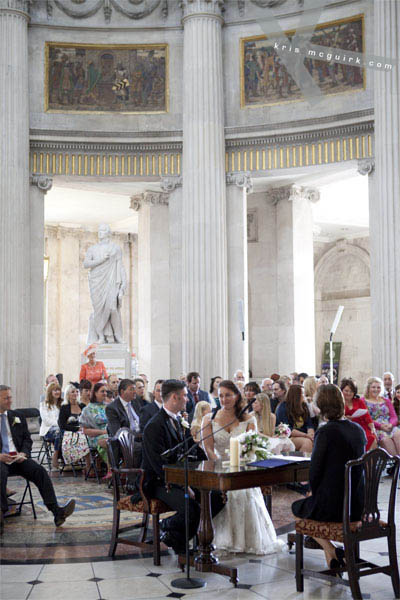 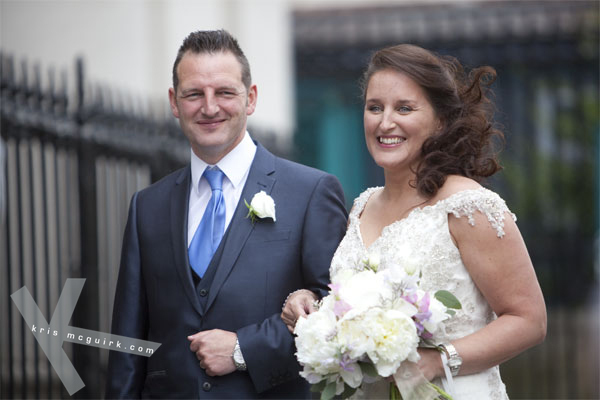 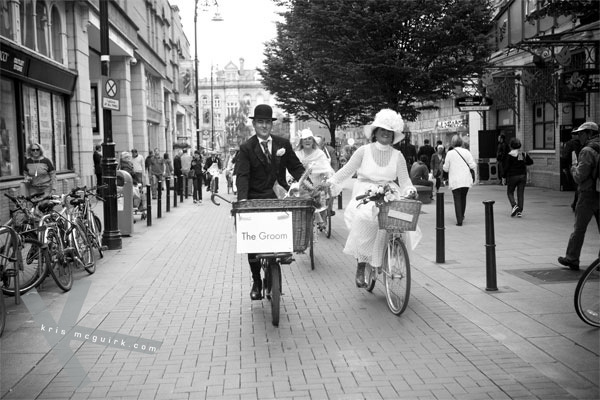 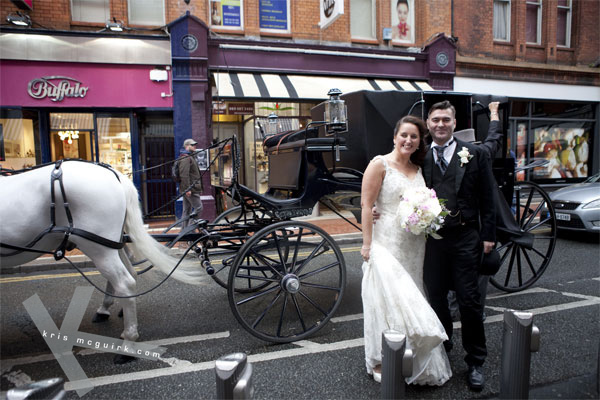 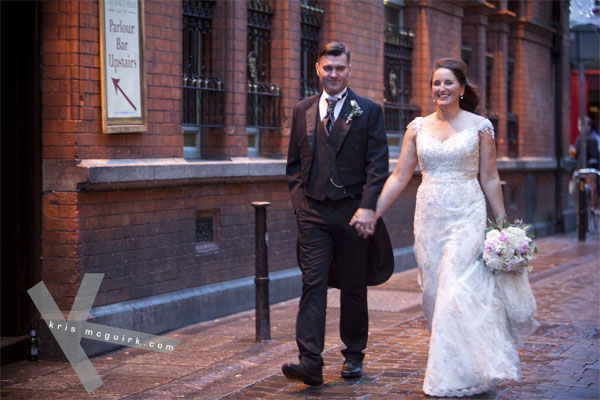 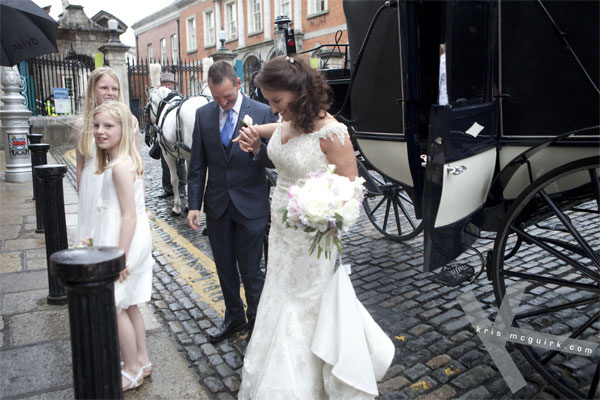 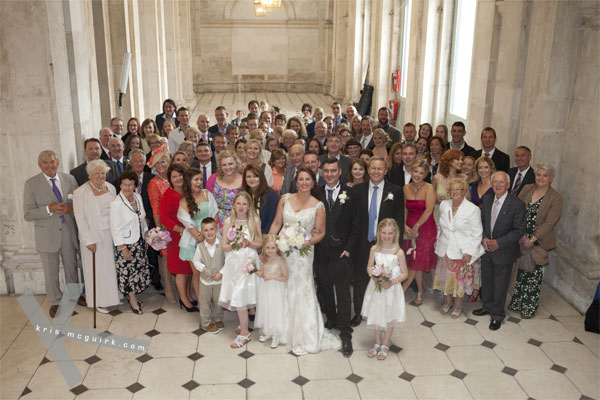 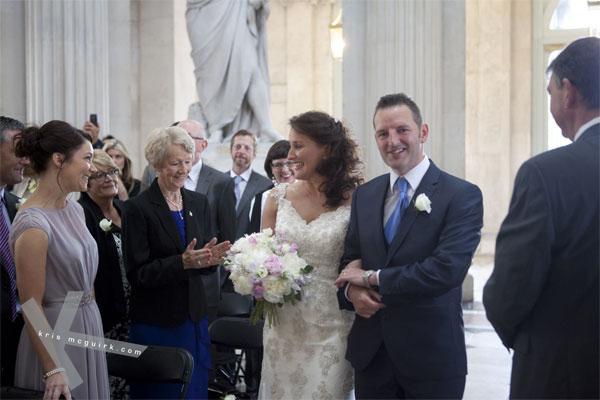 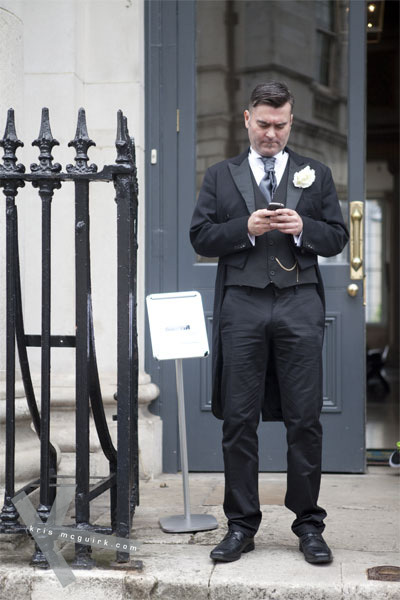 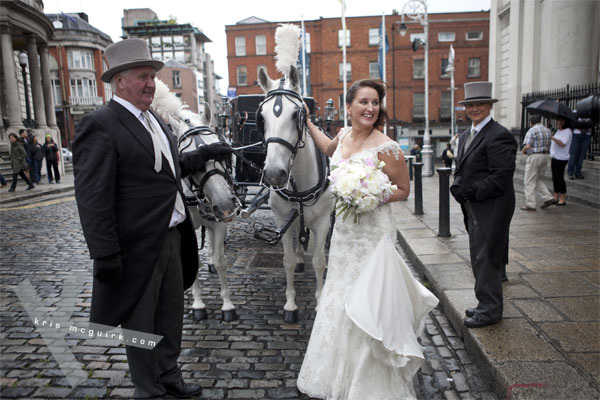 As the cyclists took their seats for a well deserved lunch at the Shelbourne Hotel, Ciaran walked to the majestic surroundings of Dublin City Hall to meet his arriving guests whilst Freda changed into her wedding dress, arriving shortly afterwards by horse drawn carriage none the less. 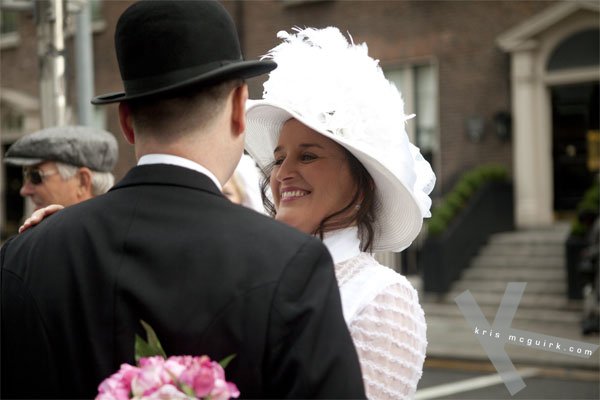 By late afternoon, everyone had arrived for an intimate dinner in Fallon & Byrne restaurant with a relaxed atmosphere, moving speeches before the party got into full swing. 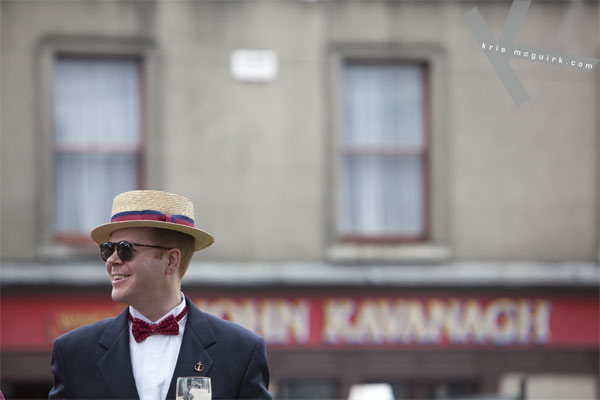 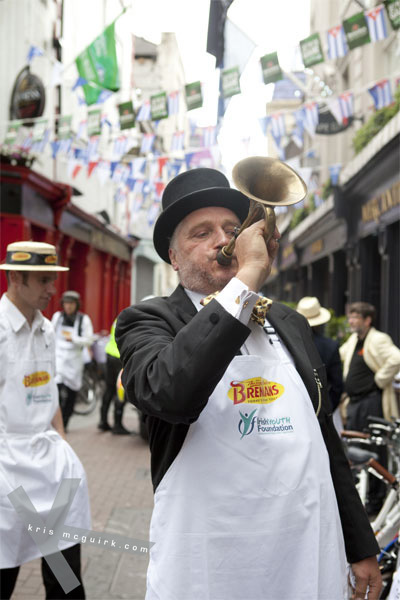 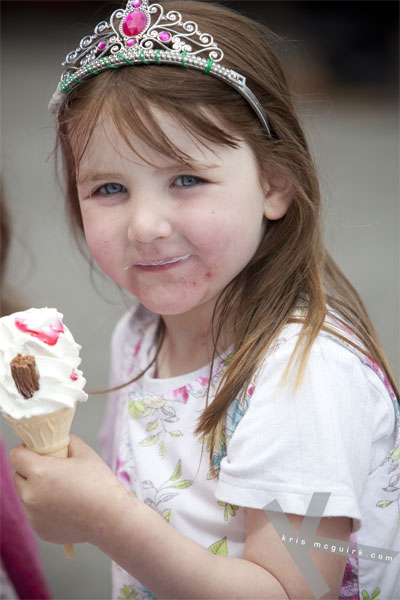 If this was not enough, the pair threw in another day of amazing entertainment for their extended family and friends the following day, with a vintage-themed garden and street party in the square outside of Ciaran’s family’s famous pub “The Gravediggers”, complete with a full brass band, an ice-cream van that dispensed 99’s to the delight of young and old. 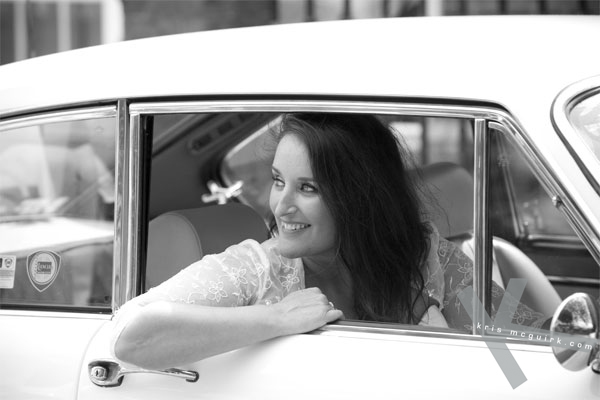 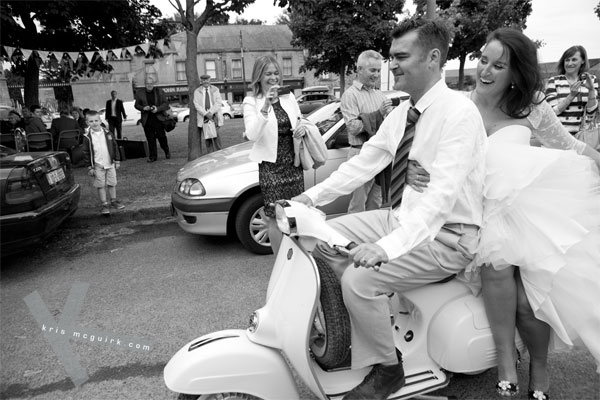 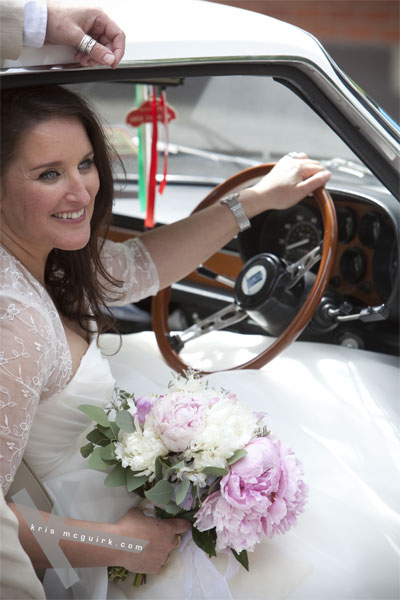 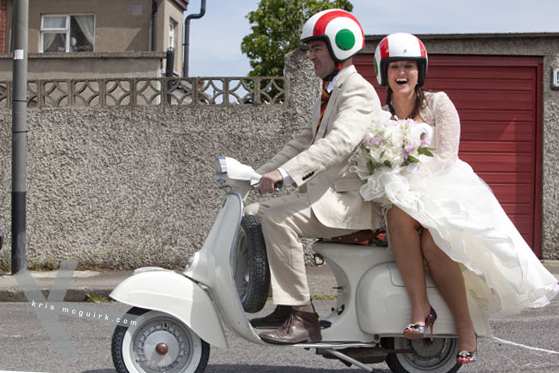 The day wouldn’t have been complete without a spin around the block on Freda’s amazing wedding gift to Ciaran – a beautifully restored classic 1960’s Vespa and vintage Lancia coupe offered plenty of opportunity for cinematic inspired portraits. 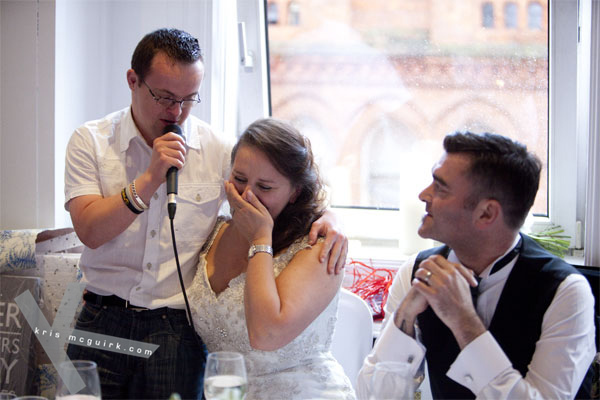 I’ll let the images speak for themselves.